It’s that time of the year again—time for the kids to head back to school for another year of growing and learning. Most parents would be relieved to have their children back in school, but if you are a parent of a child with a health condition, it can be a frightening thought. You might stress about them forgetting to take their medications or not taking the recommended doses. For a child, taking medication can be overwhelming, especially if a parent or regular guardian isn’t there to comfort and guide the child. Yes, there are school nurses, but if a child does not feel comfortable around them, it may be difficult for them to get the proper treatment. However, if your child has allergies, sinus problems or asthma, there are certain treatments that will ease your child into taking their required medications, even when you yourself are not there to sooth them and guide them through it. The fall is a peak time for allergies and sinus infections. Some sinus complications may occur as a result of fall allergies, but can also develop due to bacterial or fungal infections. Fall allergies, or hay fever, are a result of the pollens of weeds and molds. Ragweed, the main fall allergy culprit, typically begins pollenating mid-August; however, this year came early in the Midwest region due to a wet and cooler than usual summer. If your child shows the same symptoms during this time of the year, they are most likely allergic to ragweed pollens. Symptoms are similar to spring and summer allergies and include nasal congestion, sneezing, runny and/or itchy nose, post nasal drip, itchy, watery eyes, headaches and fatigue. Ragweed season is unpredictable and usually concludes after the second frost. Another symptom of fall allergies is susceptibility to sinus infections. A sinus infection occurs when sinus cavities become clogged due to swelling. Allergies can cause this to happen, resulting in symptoms similar to a cold or the flu, but usually includes sinus pressure. Sinus pressure and/or pain take place in the forehead behind the eyes, above the cheekbones, toothaches or in the jaw, and behind the head where the neck begins. It can also cause ears to feel pressurized, similar to when you are in an airplane. Other symptoms of a sinus infection include a low grade fever, fatigue and feeling weak, a thick yellow-green discharge from the nose, bad breath, loss of smell and/or taste, swollen or puffy eyelids and underneath the eye, and congestion. If your child has fall allergies and obtains a sinus infection as a result, they are going to need kid-approved treatment in order to relieve symptoms. Over-the-counter treatments will help relieve symptoms, such as nasal rinses, vaporizers, steam inhalers, or warm, moist cloths. Allergy Asthma Technology’s Margo Moo Steam Inhaler is extremely effective in relieving symptoms from allergies, sinusitis, and even works for colds and the flu. 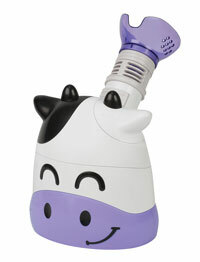 It delivers steam through a kid-friendly device that features a cow face that will break up congestion, allowing children to breathe. Once sinus cavities are clear, sinus headaches and other pressure will stop, as well. Asthma can be induced by allergies or sinusitis, or the child could have the condition separately. Having asthma as a child can be a very overwhelming situation. They are not able to participate in the activities that other students may participate in during school, or if they are able to, they need special medications. Taking the medication can be terrifying in itself. Allergy Asthma Technology provides nebulizers in the shapes of animals that will deliver the child’s medication in a manner that will ease the child. The fun animal shapes and faces are designed to distract the child while they take their asthma medication to make taking their medication a less scary experience.